Tough good looks & comfortable - rolling mechanics seat with locking storage drawer increases productivity by keeping essential items handy, and secure! Four 4" full-swivel ball bearing casters, two locking. HWT-D steel pull-out, locking storage drawer measures 19"W x 14-1/2"D x 5"H for storing tools and more. 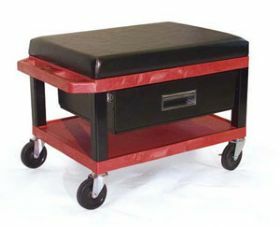 Measures 18-1/2H x 18W x 24"D. Choose from Blue, Red, or Black shelves with Black legs and cushion -- please specify. FOB Shipping Point.